The Royal Gazette has commissioned a new poll and the results are telling. Without looking at the full picture historically it is difficult to see why these results really stand out. The big difference in this latest poll is that both parties have largely mobilized their support bases with the number of undecideds at 18% which is the lowest level all the way back to Sep 2011. This suggests many undecided voters have solidified their views vs wait until the actual election. A big point of note about the 2012 election was that overall 1200 fewer voters bothered to turnout vs. the 2007 election. The message was that people weren’t interested and reflects the rise in individuals who supported neither in the polls immediately prior to the election. People were disillusioned with politics generally and worn out by the recession with limited hope. Leading into the 2012 election the PLP’s support had plummeted in the polls. The result proved to be a 52% to 46% victory for the OBA. 2600 fewer voters voted for the PLP overall vs. the 2007 election while nearly 800 more voted OBA. This was also while there was a rise over nearly 1700 in the overall number of registered voters. The big story wasn’t that people turned out in droves to vote OBA, it was that people didn’t turn out to vote PLP. Contrast this with the latest poll results. The OBA’s support level of 44% is the highest OBA level of all of their poll results and represents a strong level of support. 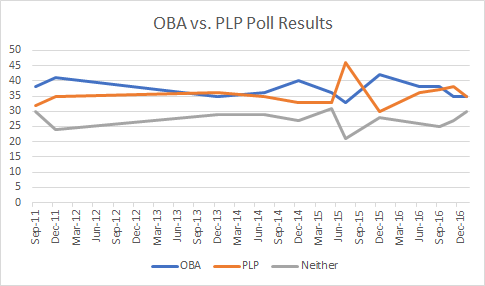 Compared against the Dec 2012 election, the OBA’s support level has strengthened 3 percentage points above it which could translate into a higher number of votes than the 2012 election. The PLP also has a strong showing of 38% which matches their highest numbers if you discount the odd anomaly of July 2015. Taking the anomaly at face value, it was the next lowest level of undecideds with many having sided with the PLP. It placed PLP support at 46%, 6 points higher than they are now. The big question is whether these people have shifted to support the OBA or if they’re waiting until election day to finalize their opinions. July 2015 was the only poll in the chart done by Profiles of Bermuda and there is no particular explanation that I can think of for the wild change over previous trends. Polling is not an exact science and relies on truly random samples to provide accurate results so it could be in error or it could tell us something. How will this affect numbers? In 2012, 15,949 votes were cast for the OBA. 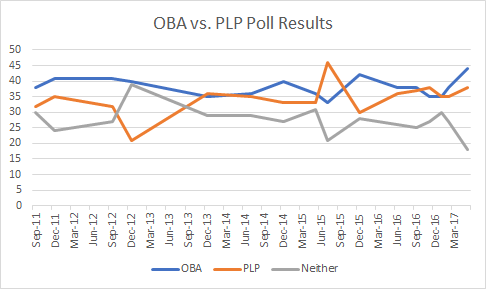 Those extra 3 percentage points above the 2012 poll numbers suggest the OBA’s support level could be higher this time around. By contrast, in 2007 16,800 people voted PLP. 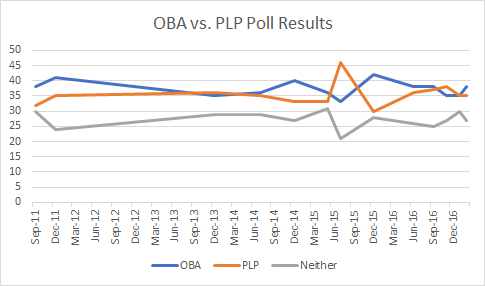 Is the OBA’s 3 points is enough to break above the PLP’s strong 2007 number or will the PLP rally enough support? Each party looks like they’re be able to rely on their staunch supporters. They also seem to have rallied strong supporters and we can likely expect a strong turnout in the upcoming election. The question is who will rally the swing vote to their cause? There are 4 different companies quoted for poll results, Global Research, Total Research Associates, Mindmaps.bm and Profiles of Bermuda. Of particular note, the Jul 2015 spike for the PLP represents the only instance in the chart of polls supplied by Profiles of Bermuda. Without getting too deep into the intricacies of survey sampling and polling methodology. Accurate surveys rely on a truly random sample of people. Ideally, you put every registered voter’s name in a hat, pick out a percentage at random and ask their opinion. Given a large enough percentage this would give you an accurate view of the overall population’s opinion, plus or minus a margin of error. In the age of telephones, cellphones with caller id and the internet, it is much more difficult to get a truly random sample. Some people don’t have telephones, others won’t answer unknown numbers. How do you get a random sample if it is unnaturally selected based upon who answers the phone? (This is one of the big reasons why internet and phone polls can differ quite a bit from actual results). This is of course before getting into the whole explanation of how leading questions and push polling can influence results. How you ask a poll question can lead people to one answer or another and give a different view when compared against a slightly different question. These days survey companies tend to rely on polling a more limited pool of people and bias in constructing the questions can swing things. Thus it is harder to get a random sample and the results can end up being skewed. So, surveys are a guide much like looking at a partially completed jigsaw puzzle. It gives you an idea of the bigger picture but if you only see pockets, you can think you see the whole picture when really you could be missing a crucial part. As suspected, the opposition to the airport deal dried up The PLP overplayed the Airport Card and the OBA has run a relentless campaign of public outreach, feedback and awareness building. Public support has now shifted from opposing the airport deal to supporting it. Likely the PLP will have to regroup and re-strategize and the OBA will reflect on what worked. Many, like this writer, likely have just gotten tired of the airport deal. Ultimately its an airport, we get it back in 30 years and if it truly proves to be a bad deal, that’s 30 years the OBA won’t be able to dodge the blame for it. It is really too bad that we’ll be spending a fortune to create a non-Bermudian looking monstrosity, but it certainly isn’t worth tarnishing our reputation of stability or disrupting America’s Cup over it. The question is, what next? I put together longer term stats from the Royal Gazette’s polls going back over the last few years to get a better idea of the context of the momentum of each party. I’m not really sure why the Jul 2015 number was so different but it did foretell the shift in momentum. Ultimately, the PLP were on a successful run up until the Genevieve-Tweed crusade with the OBA sliding. They were neck and neck, possibly with a shift in momentum approaching. The PLP will need to shift focus and start thinking about the upcoming election. They’ve done a good job at opposing the government but haven’t really laid out a plan for what they’d do as government. This will be the time they start capitalizing on the OBA’s forgotten election pledges and setting the tone. Given the loss of momentum and the approaching hype of the America’s Cup we may see them shift to a more mature stance. Perhaps trying to highlight the lessons learned from being removed after their first stint in power and how they have learned from their mistakes and starting to signs of reinventing themselves under their new and capable leader. The OBA may get complacent and take forgranted this recent win of support or they may take the time to take a step back and really evaluate what they’ve acheived. They very clearly invested a tremendous amount of effort in public outreach, educating the public, consulting (sort of), leveraging social media and generally attempting to involve the people like never before. Is the OBA finally shifting away from most used play in their playbook? It’s hard to say. The odd one out who perhaps has suffered the most in this is “The President of the BIU” Chris Furbert. After people didn’t heed his call to turn out to protest the airport he attacked the people for lack of support rather than inflecting on what he might have done to kill support. It is likely that investing heavily in Reverend Genevieve-Tweed when he wasn’t by any definition a “Son of the Soil” and threatening America’s Cup likely evaporated support for his cause. Fundamentally people tend to go back to asking themselves “How will this benefit and impact me?” and “President” Furbert didn’t deliver compelling answers to those questions. One can wonder if Chris Furbert will survive this and still be President of the BIU not long from now. Certainly attacking the people for his missteps in leadership doesn’t seem like a very good strategy. So what’s next? What strategy will the PLP pivot to and will the OBA learn the value of involving the people in the process? Likely we’ll have to wait and see.